Publication details: Book. 2002. ix and 70 pages. Publication date: 2002-09-10. 57 full color illustrations. Spiral binding. When the Programme of the Permanent Educational Center in Otology at the University of Rome 'La Sapienza' started its First Basic Course on the Temporal Bone in 1996, a long-standing dream of both my teacher, Professor Roberto Filipo, and myself was realised: to create a reference point for all colleagues who, in mid-southern Italy, wished to make a start in, or to improve their knowledge of, otology and otosurgery. The presence of a prestigious foreign guest of honour at each course, the use of advanced technology and, last but not least, the informal set-up of the courses expressly desired by Professor Filipo, have been the winning weapons for the ever greater diffusion of our Center in Italy as well as abroad. and, most of all, my beloved Simonetta for her support. The temporal bone is an anatomical jewel box of extraordinary complexity. Both the minuscule scale of its vital structures and their convoluted three-dimensional relationships make microsurgery of this region one of the most technically demanding of all operative endeavours. Unravelling the mysteries of temporal bone anatomy is the foremost challenge faced by every otologist. The goal of achieving perfect knowledge and facility will never be achieved. No matter how experienced a surgeon becomes, ongoing study of the finer points of temporal bone anatomy (observed both in the operating room and dissection laboratory) serves to maintain and improve his or her skill. Dr Barbara has produced a highly useful Manual of Temporal Bone Dissection to guide exploration of the temporal bone. Its stepwise approach will prove useful for both the novice otologist and the experienced surgeon seeking to refresh his or her knowledge. Its orientation upon specific surgical procedures, rather than pure anatomy, enhances its utility for the practising surgeon. 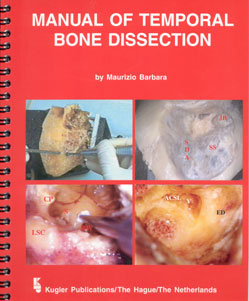 This written resource is an essential element of the three components needed for a high quality surgical dissection course: a lucid manual (such as that authored by Dr Barbara), informative didactic sessions, and anatomical dissection proctored by expert microsurgeons. The team at 'La Sapienza' are to be congratulated for their efforts in producing an outstanding educational programme. This is a delightful and comprehensive presentation of the anatomy of the temporal bone. The author set out an easy to follow guide to the anatomy and relationships of the individual structures within the temporal bone. This is presented from a surgical bias and is full of helpful hints for the surgeon, ie from the most basic sitting position in front of the microscope, to the use of burrs and other instruments. Each section is well labelled and dearly arranged, the manual facilitates a comprehensive tour through the temporal bone with clear reference to the salient anatomical landmarks and how to identify these structures. The author uses abbreviations, which are dear and referenced throughout the text. Unfortunately the print quality does not always do justice to the photographs. I think this is an excellent manual for both junior and experienced surgeons alike and is easy to follow.